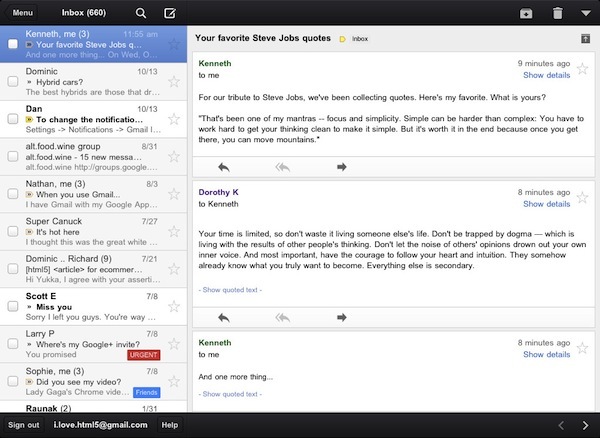 Google has just released its first official Gmail app for iOS, available on the App Store here. The app runs natively on the iPhone and iPad, features notifications, messages threads, Priority Inbox and many other Gmail features from the web interface. In developing Gmail for iOS, Google says they have tried to bring the best features of Gmail for the web -- which is also optimized for iOS devices -- to the iPhone and iPad while taking advantage of the native capabilities of these devices. The company has indeed implemented name auto-completion and Camera Roll integration for image attachments, but we couldn't find support for multiple email accounts in this first version. Also, we were unable to receive "badge notifications" for new messages, although this may be related to the just-launched nature of the app and an error that several users are reporting on Twitter. The lack of multiple account support is disappointing, frankly, as the app simply loads up a web view upon first launch, asking you to log in with a Google account, and that's it. 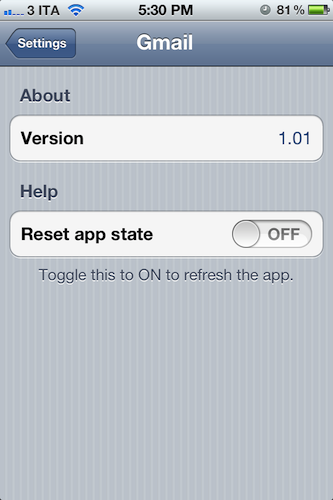 There are no settings, no account options -- there is a "reset app state" button in the iOS Settings app, which will simply reset the app's state (logging you out of your account) as the name suggests. As many have already noticed, the interface of the app seems to consist mainly of a web view inside a native environment that guarantees some of the aforementioned features such as attachments from the Camera Roll. Some animations are smoother than Gmail's web counterpart -- such as the swipe-to-reveal Inbox action -- and this should be an advantage of the "native" nature of some elements of the app. Other animations and menu, however, are clearly web-based, and not as smooth and responsive as you would expect from, say, Apple's Mail app. Overall, it appears Google took Gmail's existing web app for Mobile Safari, added some new features and graphical elements in the inbox and message list, and released it as a free app on the App Store. This app clearly can't be compared to Android's native Gmail experience, or Apple's Mail app for iOS, which still remains a fine and powerful client. If you're a fan of Gmail's web app for iOS devices, I believe you're going to like some improvements of this "native" version, but I can't imagine any Gmail power-user -- people who regularly switch between two or more accounts every day -- doing any serious email work with this app. There are some nice improvements over the Gmail web app for iOS devices, but this is far from the "pretty fantastic" native app many were expecting. 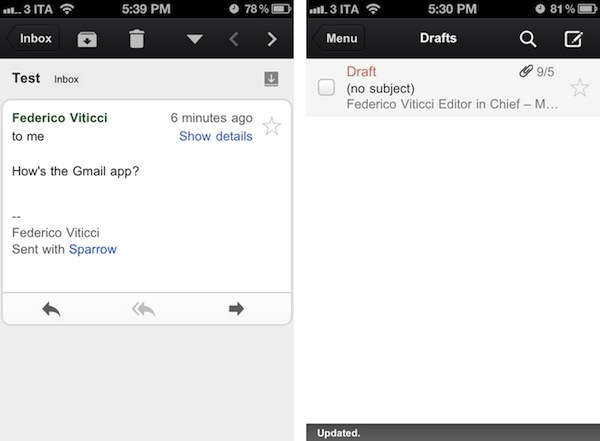 You can find Gmail for iOS on the App Store. Update: Google had to pull Gmail from the App Store to fix the notification bug mentioned above.